Knowledge base system by WebSite Scripts Company has been updated today with the release of Knowledgebase Manager Pro v6.2. We would like to present you a new version of our knowledge base system. Knowledgebase Manager Pro v6.2 has been launched today. Our primary goal in this update has been to make user experience more solid and consistent. We paid attention to many little things that you may not notice at the first glance, but if you’re working with the software on day to day basis, you’ll definitely feel the improvement of the efficiency. For instance, when you receive a user’s question by email you will know if the question has been asked in regards to particular article. It helps greatly in responding to user’s inquiry as precisely as possible due to your awareness of the question context. Also you can edit the template of the email with user’s question and, for example, you can add certain tag to it to tell emails sent via the knowledge base feedback form apart from other emails in your mail box. Another convenient new feature allows you to define default language and time settings for each new user you add to the knowledge base. This will help to save much of your time and your users’ time as well. 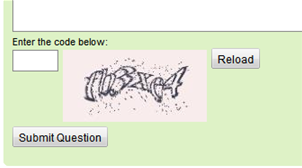 We also improved Captcha anti-bot protection feature. It is now more resistant to automated spam submissions and easier recognizable by humans. It also has a reload button now, so users wouldn’t have to struggle with occasional fuzzy captchas. This update also features some SEO improvements – certain auxiliary pages that should not be indexed are no longer indexed by search engines. Please follow the update instructions to update your knowledge base to the latest version if you’re using the on-premise edition. Customers of the hosted edition do not need to do anything about the update. We will take care of updating their knowledge bases as soon as possible, no longer then within the next 6 business days. How to Try Knowledgebase Manager Pro? Should you have any questions, feel free to leave a comment below and contact us directly. This entry was posted on Monday, September 3rd, 2012 at 1:53 pm	and is filed under News, Releases. You can follow any responses to this entry through the RSS 2.0 feed. You can skip to the end and leave a response. Pinging is currently not allowed. It runs on a web server. This means that you can go with the Hosted edition, which runs on our website, or with the On-premise edition, which runs on your website. You can even install a website package on your computer (such as WAMP or XAMMP) and use it locally.